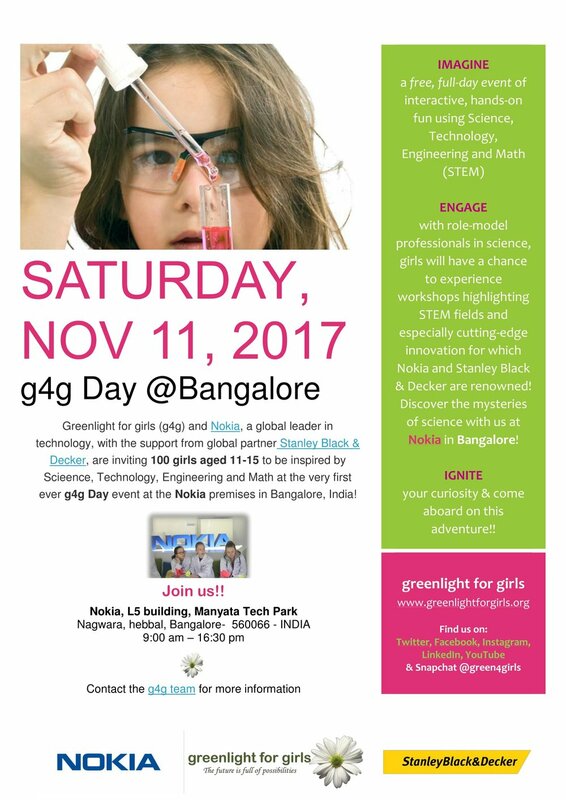 We're thrilled to have announced that g4g has hosted our first g4g Day event in Bangalore, India at the Nokia premise! Together with a fantastic Nokia team and support from global partner, Stanley Black & Decker, we invited 100 girls aged 11-15 to the Nokia premises in Bangalore for a full day of hands-on activities in STEM! From DNA extraction and Virtual Reality to electronics with flying saucers and a 5G escape room, the girls spent a full day of fun & inspiration from role-models in STEM fields, and all the while highlighting the cutting-edge innovation for which Nokia and Stanley Black & Decker are renowned! What? Welcoming 100 girls aged 11-15 from local communities to come and join us for a day filled with interactive and hands-on fun in Science, Technology, Engineering and Mathematics. How? We invited role model professionals to lead 45 minute workshops that show the link to STEM, with 20 girls in one workshop. Girls had a chance to experience 2 workshops throughout the day. As supply chain lead at Stanley Black & Decker, Sunita is passionate about the g4g mission and proud to be part of the very first g4g Day Bangalore. Excited and proud to be part of the very first g4g Day Bangalore, Farheen is a proud empoyee and marketing professional of the Stanley Black & Decker team. Passion. Energy. Enthusiasm. That sums up Sunitha who has taken lead to initiate various programs such as GEMS, various employee engagement activities, Mentoring, trainings on soft skill and ofcourse along with her core consulting work at Nokia and what keeps her going is never say die attitude.